A listing group is a special kind of class that defines multiple listings, which are supplementary in the sense that they are defined outside of the cube definition. These can be any kind of listing supported by InterSystems IRIS Business Intelligence. You can give users access to the Listing Group Manager so that they can define additional listings without modifying the cube definitions. The cube or cubes in which the listings can be used. The resource that secures each listing (by default). A listing group cannot override listings defined elsewhere. A listing group is either disabled or enabled. If a listing group is disabled, its listings are not available to any cubes. If a listing group is enabled, and if it has been compiled, its listings are available to the specified cubes. The listings in a listing group are not available until the listing group has been compiled. The listing group can have an associated resource, so that only users with access to that resource can edit the listing group. Note that the Analyzer and the Dashboard Designer do not display the listing groups themselves, but rather simply display all available listings. End users do not have any information about where or how any given listing is defined. Click Analytics, click Tools, and then click Listing Group Manager. If there is a listing group in this namespace, the Listing Group Manager displays the last listing group that you looked at. Listing Group Name  Logical name of the listing group. You can edit this later. Listing Group Class Name  Class name of the listing group, including the package. Listing Group Description  Optional description of the listing group. You can edit this later. Or click the X in the upper right of the dialog box. The left area displays the logical name of the listing group (Sample Listing Group in this example), followed by the names of the listings in this listing group. You can collapse and expand this part of the display. The right area displays details for the item that you have selected on the left, either the listing group or one of the listings defined in it. The system then displays a dialog box. Now you can modify details of the listing group (which affect all the listings it contains), as described in the following subsection. Or you can add listings, as described in the later in this chapter. Disabled  Optionally click this to disable the listing group. If you do so, the listings in this listing group are not available to any cubes. Listing Group Name  Specify the logical name of the listing group. Listing Group Display Name  Optionally specify the display name of the listing group. If you select a cube, the listings will be available in that cube and in any subject areas based on that cube. If you select a subject area but do not select the cube on which the subject area is based, then the listings are available only in that subject area. The listings are available only if the listing group is enabled and compiled. Listing Group Resource  Optionally select the resource that secures this listing group. Only users with access to this resource can edit this listing group. For information on how resources are used, see “Setting Up Security” in Implementing InterSystems Business Intelligence. Default Resource for Listings  Optionally select the resource that, by default, secures each listing in this listing group. Group Description  Optionally specify the description of the listing group. After making changes, click either Save or Save As. If you click Save As, the system prompts you for a new logical name, a new class name, and an optional new description. To make the changes available to users, be sure to also compile the listing group. Click the name of the listing group. Now you can modify details of the listing group (which affect all the listings it contains), as described in the previous section. Or you can add, modify, or remove listings, as described later in this chapter. When you do, the system adds a new listing (with no details) and automatically saves the listing group at this point. The left area displays the name of the new listing; it has a name such as New Listing or New Listing1 and so on. Click the name of the newly added listing. Note that you cannot specify a listing name that already exists in the target cube or cubes; a listing group cannot override listings defined elsewhere. Click Save to save the listing group. Or click Save As to create a new listing group. Display the listing group that contains the listing. In the left area, click the name of the listing. Click Save to save the listing group. Or click Save As to save the listing group with a new name. Click Remove Listing and then click OK. If Disabled is cleared, make sure that Listing Group Target Cubes specifies at least one cube. The system then saves the class (if needed), compiles the class, and displays a message to indicate that it compiled the class. If there is no target cube specified. In this case, make sure that Listing Group Target Cubes specifies at least one cube and then recompile. If a target cube or subject area specifies disableListingGroups="true". The compilation error includes the text Target cube does not accept listing groups: . In this case, remove that target cube, leaving any others, and recompile. 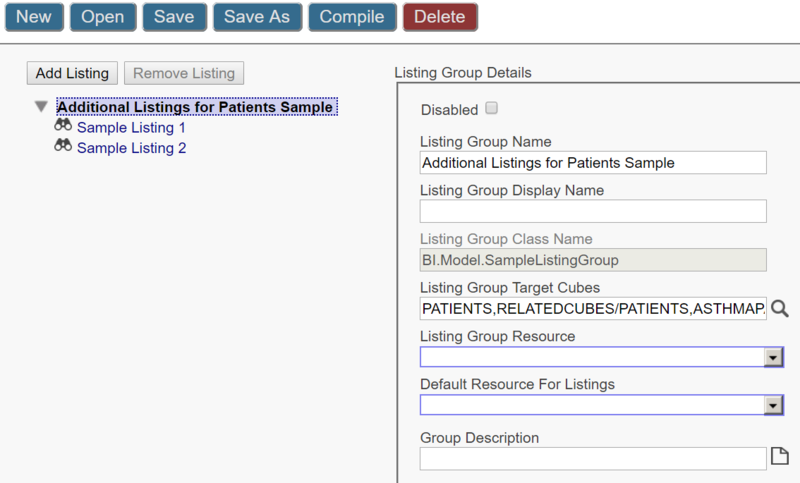 Or modify the cube or subject area so that it can accept listing groups and recompile the cube or subject area. For information on disableListingGroups, see “Reference Information for Cube Classes” and “Reference Information for Subject Area Classes.” You cannot specify this option via the Architect. The system then deletes the class and displays a message to indicate that it did so. The listings in this listing group are no longer available.